Luis Rivera, MD, accepting the Dr. David Monash/John Caldwell Scott Scholarship awarded by the National Medical Fellowships at the Chicago Champions of Health Awards event in November. Luis Rivera, MD, a first-year resident in Family and Community Medicine was recently awarded a $25,000 scholarship from the National Medical Fellowships for his commitment to serve underserved populations in Chicago. The Dr. David Monash/John Caldwell Scott Medical Student Scholarship Program works to provide financial support to medical students and residents committed to underserved populations of Chicago. Dr. Rivera’s connection to Chicago healthcare goes beyond his work in medical school: growing up on the south side of Chicago he witnessed the shortcomings of the healthcare system firsthand when his father was diagnosed with Parkinson’s disease and they had a difficult time finding a doctor who they could connect with to provide the level of care needed. “This experience opened my eyes to the very real need for more doctors in my neighborhood,” Rivera said. Rivera said that growing up, medical school had always been a dream, but supporting his family trumped the financial and time commitment required to pursue medical school. Rivera worked for 11 years as an electrician at various area hospitals, including construction at Northwestern Memorial Hospital. While working at Stroger Hospital, he decided it was time take action. 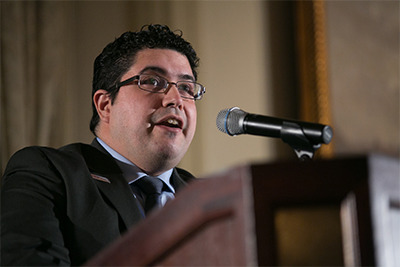 Rivera received his medical degree from the University of Illinois at Chicago in 2014 and is currently a resident at the McGaw Medical Center of Northwestern University, working at the Erie Family Health Center.